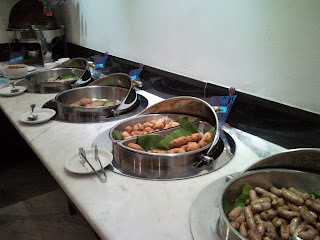 Last weekend seemed to have been a continous series of buffets. Continuing on our mission to try restaurants in Jayanagar, we decided to go to Isys - another restaurant of the President Hotel (Gufha being the first). Isys means a goddess of immense strength, though am not really sure of the connection to a restaurant. On a sidier note - maybe you eat the food and gain the strength of a goddess. 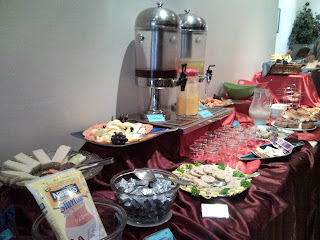 Anyways stupidity aside, the continental breakfast was quite a surprise in a nice way. 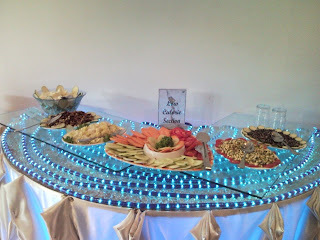 The restaurant is done up in blue hues and so is the buffet setting. To start of they had an interesting low calorie section for the weight watchers with sprouts of three varieties and garden fresh salads of two kinds. There was also slim milk and margarine available. Then came the actual spread - chicken pate, fresh fruits, juices in orange and grape with a mango milkshake thrown in for good measure (Sudhakar and I couldn't agree on whether it was packaged or not). 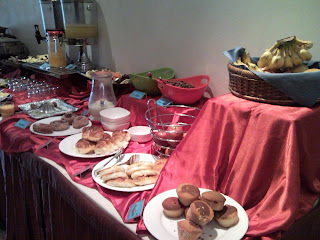 Next came the croissants and cakes - sugar doughnuts, cupcakes, a steady stream of fresh fruits, cereals (chocos and corn flakes) with milk. There were also chutney and cucumber sandwiches. Next came the vegetarian section. 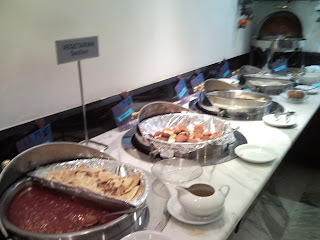 Baked beans, french toast and honey, corn cutlets with salted chips, set dosa with chutney, idli-vadas with sambar. There was also upma, maddur and regular vadas and Mangalore bajjis. The sausages were tossed with pepper and capsicum and would have tasted 'really' good if they had been hot.